Using heart rate (HR) to control training intensity requires the coach or middle-distance runner to monitor the average HR during a workout session, time trial, or race. The average race HR is called the performance HR and is specific to each runner. Training intensity is then controlled relative to performance HR. The use of performance HR correlates with the training laws of adaptation, specificity, and training overload, and is a useful marker to follow under some training conditions. Heart rate monitoring is especially effective in controlling the intensity of aerobic foundation training when the goal is to run at a velocity as close to the aerobic threshold pace as possible. Heart rate monitoring is also useful for measuring recovery intervals during intense anaerobic sessions on the track. 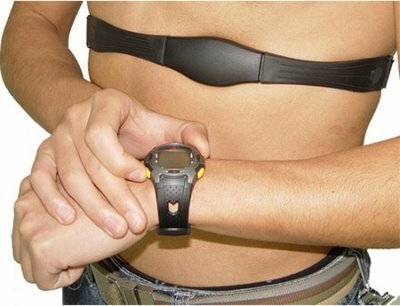 To determine the individual performance HR, the runner wears a HR monitor containing memory in which to capture individual heart beats start to finish, and then average these data sets over the entire aerobic activity. It may be useful to start capturing beats one minute into the activity and shut down capture one minute prior to the finish, especially if the athlete finishes an aerobic workout with a burst to the finish. RELATED: How to use the tempo run in endurance training. Coaches and athletes have commonly used percentages of maximum heart rate (MHR) to control energy system training. The drawback to percentages is that each athlete is different. Each percentage must be calculated individually as these values cannot be generalized. However, most coaches do generalize and determine aerobic energy zone training using MHR as follows: 70-80% of MHR corresponds to 60-70% of VO2 max which is considered the zone for the aerobic threshold for one standard deviation of the general population.. Using an estimate of MRR (ex. 220 – age) may introduce a large error, up to plus or minus 12 beats per minute for many individuals and as large as 36 beats for outliers. This means that the HR of a college sophomore middle-distance runner with an estimated MHR of 200 (220 – 20) cold be as low as 164 beats per minute or as high as 236 beats per minute. As a middle-distance runner improves in fitness, heart rates change. The range of 50-85% HRR is large. At 50%, the runner might find that the training is extremely easy, while at 85% the athlete might find it hard to maintain the training intensity for more than a few minutes. In essence, the training intensity will likely be somewhere within this HR zone, but exactly where in the zone is the problem. Prescribing training HR targets need to be precise. The only workable scheme is to use performance velocity or a measured performance heart rate to set intensity if using heart rate monitor training. How to plan training for the high school middle distance (800-1600) runner. In training middle-distance runners coaches should educate their athletes to rely on three means of self-assessment for calibrating an individuals training intensity: (1) heart rate, (2) velocity, and (3) their level of perceived exertion. Coaches can put numbers to the first two, and descriptors to the latter. Heart rate is most effective in measuring recovery, velocity is used to measure the work, and perceived exertion is how the athlete describes the combined work and recovery, i.e. hard, medium, easy, intense, etc. All three means are important in the coach communicating with the athlete as to how the workout should be done and how it should feel. Relying strictly on heart monitors to set-up a training session introduces too many variables to an already complicated procedure. Want to see more information like this? Enter your valid email address and we’ll send you Coach Christensen’s CTF exclusive ebook, ‘The Career Distance Coach’…for free.